The polite (really!!) Bengali food blogger is back with a not so polite dish this time 😛 ; Chanchra. Call it Chanchra or call it Chancharika alike famous Bengali writer Shankar; you will not find any difference in taste in the famous Bengali “Mishmash” prepared with lots of veggies and obviously with the fish head and fish bone. Yes, we are proud Bengalis and we eat each and every part of fish with love, care and ease 😎 . Chanchra is a popular Bong side dish or it is better to say a signature dish prepared with a perfect combination of veggies and fish head and plays a major role in strongly bong strictly non-vegetarian over the top Bengali lunch platter. Bengali lunch on the day of marriages or any other big fat programme is almost incomplete without having hot steamed rice with a big dollop of Chanchra which is then followed by several other items and ultimately some digestive medicine mainly Gelusil or Aqua ptychotis. Though nowadays, people prefer to opt for catering services for making and serving food on big occasions. 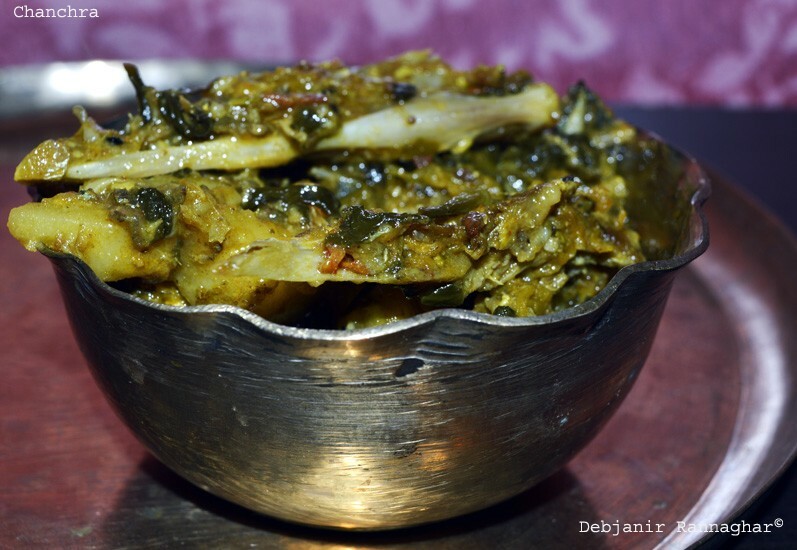 However, those who had have witnessed the traditional cooking by the Rannar Thakur (individual cooks) they must have witnessed the making of the Chanchra using the leftover fish heads from the big fishes purchased for the grand dinner. Me being born and brought up in north Calcutta have witnessed Rannar thakur’s making this amazing dish many times. Though Caterers also serve Chanchra on demand but watching Rannar Thakur making it is a real pleasure. This Durga Puja after many years I saw the Rannar Thakur making Chanchra for the Saptami special lunch in our society’s puja and from that day I was planning to make it and to share the recipe here in Debjanir Rannaghar and look at me; it took me more than 4 months to have it here that too after getting a request from a reader 🙄 ! Chanchra can be prepared with the head of any big fish including Rui (Rehu), Katla or Bhetki however, head of Bhetki suits best with this dish. Though I make Chanchra once in a while given to the not so polite nature of this dish (one may need to take some antacid after having Chanchra) whenever I prepare I use the head of a big size Bhetki fish along with the pieces of the center bone. 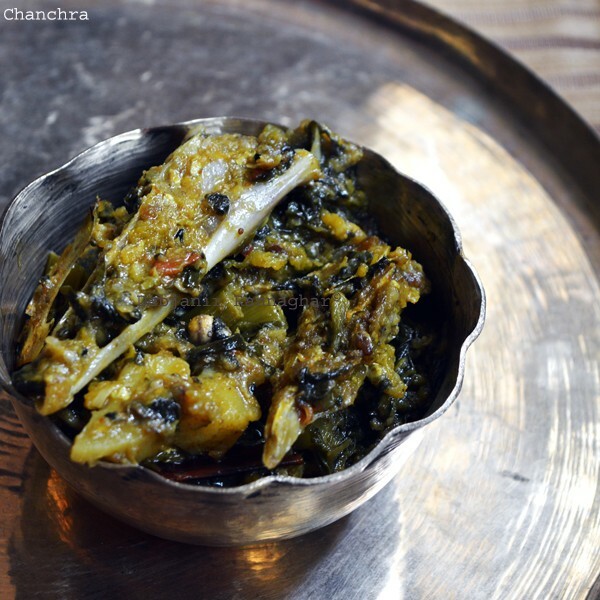 Apart from the fish head, Malabar spinach or Pui Saag is a must added leafy veggie for Chanchra. However, I heard from my friend “S” that some people use “Katoya Da(n)ta” instead of Pui Saag. In addition, Potato, Pumpkin, Onions are also added in Chancharika and I prefer to add few pieces of Eggplant or Begun to give the dish a body. Panch Phoron or a mix of five spices is used as tempering while preparing Chanchra. Let me share a funny thing about my Chanchra venture! I was not available with the fish head of Bhetki though planning to pick it from the market. My friend “S” informed me casually that she is having the fish head in her place as she purchased a big fish for making batter fry and without wasting much time I went to her place and grabbed the pieces of the fish head along with the central bone and back to my place with a promise of sharing a bowl full of Chanchra! 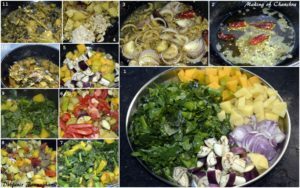 Chanchra is a signature Bengali "Mishmash" type side dish prepared with various veggies including leafy vegetables ( Malabar Spinach or Pui Saag, Potato, Pumpkin, Eggplant, Onion etc) along with the Fish head or Fishbone. Panch Phoron / Five Spices*: 1.5 Tsp. Wash Fish head and the central bone of fish thoroughly. Sprinkle half of the turmeric powder and ½ tsp. of salt and little Red chili powder over the fish head and coat with the spices and leave it for 10 minutes. Cut Potato, Eggplant, and Pumpkin after peeling the skin into small cubes as shown in the picture and keep the veggies dipped in a bowl of water to prevent blackening of the veggies. Slice Onion thinly and chop tomato roughly. Chop Malabar Spinach** after washing 2-3 times under running water. Make a coarse powder of half of the Panch Phoron and keep that aside. Now take 4 Tbsp. 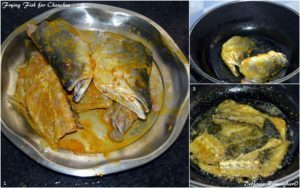 of Mustard oil in a deep bottom pan and heat the oil sufficiently and start frying fish head and fish bone in medium flame till the fish chunks soften and turned brownish and crunchy. Strain fried fish pieces using a strainer and keep those aside. Now temper remaining oil with dried red chili and remaining whole Panch Phoron. Add sliced onion and fry till the onion turned light pink in color. Add Ginger and garlic paste and mix properly using a spatula. At this point add cubed potatoes and start frying those as well. While the potatoes soften a bit add cubed pumpkin and cubed eggplant and give a thorough mix. Now add chopped tomatoes and mix properly. Once the veggies cooked at least ⅔ add turmeric Powder, Salt, Sugar and Panch Phoron Powder to it and mix properly. Finally, add chopped Malabar Spinach and mix thoroughly. At this point cover the pan with a lid and cook for 5 minutes in medium flame. Open the lid and stir veggies using a spatula and add fried fish pieces after breaking them into medium sized pieces using a spatula or hand and mix properly. Cover the pan again and cook in medium flame for 10 minutes and stir in between. No need to add water while cooking as Chanchra will be cooked using the water releasing from the veggies. Drizzle little mustard oil and give a thorough mix and switch the flame off. Serve Chanchra with steamed rice and a bowl full of Moong Daal and enjoy your perfect Bengali meal. * Panch Phoron: A mixture of Fenugreek seed / methi , Nigella seed / Kalojire / Kalonji, Cumin seed/ Jeera, Black mustard seed/ Sorshe and fennel seed/ Mauri / Saunf. ** I prefer to microwave Malabar Spinach before cooking for 5 minutes on high speed. Do try the Muri Ghonto from my blog which is a signature Bengali delicacy.